Which side will you be on when the world ends? Will you be one of the haves, an employee (or, better still, owner) of one of the ten big companies that controls everything? Will you live in relative luxury, with good food and affordable health care, safe from the weather and the rising ocean? Or will you be like Nailer, the main character of Paolo Bacigalupi’s Ship Breaker, who crawls through the passageways of long-dead ships, pulling old copper wire to fill his team’s quota so they get to eat for another day? 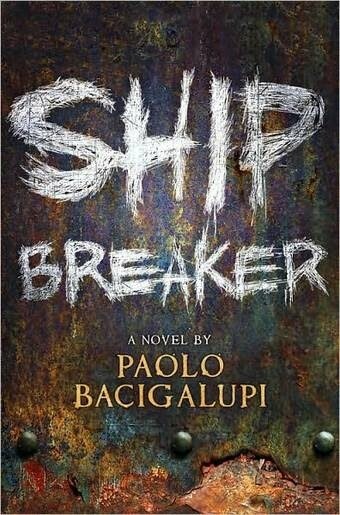 Ever since the success of Bacigalupi’s Windup Girl, I’ve been meaning to read both it and Ship Breaker. It turns out I finished the latter almost a year to the day since it was released. I’m not sure how it justifies the young adult tag it’s given — it’s brutal, bloody, violent, and depressing, and while I do think it’s a good book, it makes me wonder about what exactly comprises YA fiction these days. In Ship Breaker, Nailer Lopez leads a very difficult life. About twelve years of age, his job is to collect wire from old oil tankers and other beached vessels in the southeastern United States. He’s on a team of similarly-aged individuals, under the command of the pragmatically-ruthless Bapi. The team collects wire for one of the few big companies that controls commerce worldwide. What’s worse, this is one of the best options for Nailer, who knows that once he’s too big to crawl through the old ships, he’ll have to work heavy crew (for which he’s too small) or do something even worse. In addition to all of that, Nailer also has to deal with his father, the vicious drug-abusing pit fighter Richard Lopez. Perhaps that’s where the YA part comes from — despite everything Richard has done to Nailer, Nailer still apparently loves him. Or, at the very least, respects him for being his father, as well as for being able to beat the hell out of him. After a large storm, a clipper ship — Nailer’s dream is to work on one of these large, clean vessels, sailing the oceans — is beached and Nailer and Pima (a member of his crew) go out to scavenge it before everyone else gets there and takes the good stuff. They find a survivor — and in true YA fashion, she is the daughter of someone important — and Nailer must choose whether to kill her now or save her in hopes of a bigger payday. While the book hits all the YA tropes — rich daughter, rough main character, bad parent, hero’s journey, double-cross, big showdown at the end — where it really excels is in worldbuilding and characterization. Even the minor characters are well-rounded, from the dispassionate murderess Blue Eyes to the dog-men who work for Captain Candless. When someone is injured, the reader really feels his or her pain; when one is successful, such as when Nailer escapes death by drowning in oil, the reader joins in the jubilation. And the world itself, a semi-near future where the oceans have risen and hurricanes can be Category Six, is compelling. Not a lot of it is shown because, to Nailer, it doesn’t really matter. There’s his beach, and there’s the Orleans, and there are some mentions of Houston and a melted Pole. That’s about it. But still we know that now-destroyed coastal cities are called “Orleans” — the newest of which is somewhere in Mississippi — and we know that corporations have pretty much free reign to do what they want. We know that the Chinese yuan (I don’t think it’s mentioned by name, so I’ll call it that) is the premier method of currency, and we know that genetic engineering has taken place to create dog-men who are devoutly loyal to their patrons. In reading Ship Breaker, it’s plain to see why so many people are high on Bacigalupi’s writing. However, I didn’t adore this book in the way that I did the Terry Pratchett YA novels, or Harry Potter. It felt a little to me like the YA tropes were shoehorned into a story the author wanted to tell. Had the story been aimed at a more adult audience, or been of a wider scope, I probably would’ve enjoyed it more, but as a YA novel it just didn’t have the kind of oomph I was expecting given the accolades it’s received. There was too much “easy” stuff for me (as a writer and avid reader) to recognize, such as clear signposts which say “THIS IS IMPORTANT AND IT WILL COME BACK IN THE CLIMAX OF THE NOVEL, SO PAY ATTENTION”. That doesn’t take away from how good I think the book is — which is to say, “yes, it was a good book”. I definitely would read more adventures with these characters, and Windup Girl remains on my list. If you like dystopian futures where corporations smash the downtrodden, who in turn smash each other, then this is a good book for you. If you enjoy contemporary-style YA dystopian fiction, you’ll like it. There’s no steampunk, no supernatural, almost no high technology, but what there is is so vivid that you’ll be drawn in even if you don’t care for the subgenre. It’s worth a read. Note to Parents: This novel contains graphic violence and adult situations, though no sexual ones. I would recommend it for older teens, and younger ones who are mature enough to play MA-rated video games such as Call of Duty. Of course, you should use your own discretion when it comes to your children.